The behavior of solid and liquid matter at high pressures and temperatures is best described in a phase diagram, which shows the regions of stability of different phases of the material. Thanks to the diamond-anvil cell, which has made possible much higher pressures, and to new and very accurate theoretical models and methods, Phase Diagrams of the Elements presents the most up-to-date information on the phase behavior of all the chemical elements from hydrogen to fermium. The book summarizes, with the aid of tables and illustrations, the experimental data and the theoretical calculations. 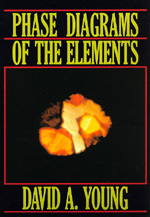 Each element is discussed in a separate section. Other chapters deal with methods, the liquid-vapor transition, and an overview of the elements. While comprehensively reviewing all that has been done in this important area, the author also points to questions that need much more experimental and theoretical work. David A. Young is a theoretical physicist at the Lawrence Livermore National Laboratory.